Over the past couple of weeks, I have been exploring how Work Trials are a valuable tool in the toolkit of the Rehabilitation Professional. They are an incredibly positive way for clients to understand their work capacity, practise their skills, and develop their knowledge in preparation for paid employment. What do we do when a client won’t take personal responsibility to simply go back to work? Here at Purple Co, we’ve had this experience. We have been working with a 45-year old gentleman who had been managing quite a common lower back injury for around 8 years. To his credit, he had retrained of his own volition and developed a new business. However, this enterprise had not been sufficient to replace his monthly Income Protection benefits. It was also identified through specific OT assessment that the type of work he had retrained into was not sustainable from an injury management perspective as his back condition was likely to deteriorate over time not improve. The client’s most expressed concern was managing his pain. However, after 8 years of lived disability and pain experience, we could all rightly assume that there would be a broader range of psychosocial issues at play here. There were. All his treatment and exercise prescription has been consistent with best practice medicine. He had engaged in rehabilitation services for over 18 months in an attempt to help him make the change to new employment, employment that was more appropriate to managing his experience of pain and potential deterioration of his condition. As you might appreciate this gentleman was disappointed that his self-employment was not sustainable. However, up until 2010, he had held a variety of positions in banking and finance. A transferable skills analysis indicated that he did present with a range of skills that could be transferred into new employment, where his need for posture change could be accommodated to assist with pain management and functional maintenance. 12 months of vocational counselling, motivational interviewing, job seeking skills development, rehabilitation counselling to address fears of new employment were all consistently provided. The insurer and PurpleCo identified that a work trial would be a useful way for this gentleman to test out his knowledge, skills and functional capability without the pressure for work performance. The aim was to provide this client with the opportunity to show what he could do, rather than continuing to focus on what ‘might’ happen, what pain he ‘might’ experience, what skills he ‘might not’ have. We wanted to provide the concrete “evidence” that said, you can work in a new role because you did this. We wanted to be able to say – Congratulations you did this! A host employer was found. A workplace assessment was completed, small issues were addressed through equipment provision and recommendation for posture variation and pacing of activity, nothing extraordinary here. Interviews were completed with the client and the host employer. The host employer was so impressed with this client that they were already talking about the possibility of paid employment. They were keen. They too could see the potential of this gentleman. The only person who was not convinced is the client. He refused to start, citing a range of issues that have only be made known to us now, 18 months on, despite weekly, sometimes 3x a week communication to maintain engagement. The host employer is now questioning the client’s attitude towards employment. The insurer is rightly questioning the spend on rehabilitation. And we are left reviewing the situation wondering what we could have done differently? If we all operated in an environment where there were unlimited resources for rehabilitation maybe we could start again? But in starting again would we achieve anything different. In starting again, are we at risk of becoming an enabler the fear and avoidance behaviour that is going on here. As you can appreciate, I cannot provide all the details many of you will want to assess what we could have done differently. That’s not the point of this post. Sometimes, rehabilitation in all its opportunities, and evidence gathering and positive psychology approach, will demonstrate that a person is not ready or willing to change. That despite best practice, and all the evidence-based practice, people don’t want to let go of their injury/ illness mindset. Sometimes in an environment where there are cost containment pressures and there appears to be very little tangible result, we have to stop providing services. Someone needs to make that call about the return on further investment. That despite all of the best efforts and insurer of the insurer, treatment providers, and us that we can’t help every client get across that line. At the end of the day, if the client doesn’t want to participate, engage or change, no amount of support is going to shift that. We at Purple Co consider we did everything possible within the context of this jurisdiction to bring about change. We can sleep easy knowing we’ve done the best job possible. That is important to us. The insurer can know they have done everything possible to support their customer. We don’t operate in an unlimited resource environment and at times the decision about not spending an insurer’s money is the most prudent decision to be made. I’m interested to know, how have you reflected upon a client experience that did go the way you expected it to go? Jo is all about connecting people to purpose through inspiration and innovation. 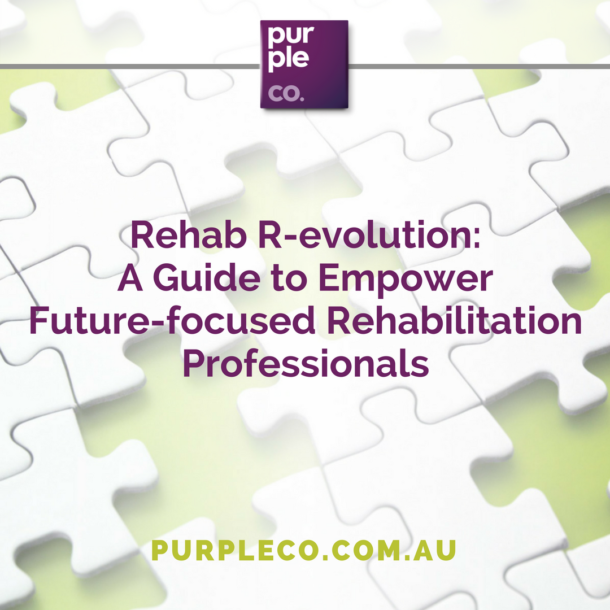 She is the Founder, Director and Principal Consultant of Purple Co (www.PurpleCo.com.au), a team of specialist allied health consultants dedicated to helping people who experience injury illness and trauma reclaim their lives through work. Jo is passionate about the health benefits of work and truly believes that everyone has the right to meaningful and rewarding employment. Purple Co grew out of this belief as a truncated form of PURpose for peoPLE. The Purple Co team also provide a range of career development and coaching services to professionals who are ready to explore change in their career and find the map towards career fulfilment.